While that headline seems like an exaggeration, it is not inaccurate. One of Snow’s strengths as a general manager has been how he moves his way through the NHL draft. The 2008 NHL draft was no exception. In that draft, Snow traded down twice (from five to seven, then to nine) to gain additional picks. This allowed the Islanders to accumulate two second round picks (one in which they were able to turn into Calvin deHaan) and a third-round pick in those trades. With the fifth overall selection Toronto drafted Luke Schenn who has been a mediocre player throughout his career and has been traded multiple times for diminishing returns. He is currently on his fourth NHL team. With the seventh pick Nashville drafted Colin Wilson. Wilson has been a dependable player who has been statistically behind Bailey in almost every season. He was traded in the offseason to Colorado for only a fourth-round pick. In the first round of the NHL draft Garth Snow made two trades to accumulate more picks, and in each trade, he got the best player (Bailey). The Islanders initially had the fifth pick in the draft, better players were picked before him, but very few were taken after him (Except for Erik Karlsson who was taken 15th). The top four picks were Steven Stamkos (Tampa Bay), Drew Doughty (Los Angeles), Zach Bogosian (Atlanta) and Alex Pietrangelo (St. Louis). When removing those players from the first round, only one player has played in more games than Josh Bailey (Luke Schenn 661, Bailey 654). He is third in goals, assists and points behind Karlsson and Jordan Eberle who was drafted 22nd (Eberle was rated 33rd by Central Scouting coming into the draft). Even taking into account that Bailey has played in more games than almost anybody in the draft class again only Karlsson and Eberle have a higher point per game average. While Josh Bailey does not have the typical productivity of a top ten draft pick calling him a disappointment would be a major mischaracterization. Contrary to popular opinion the entire Garth Snow regime has not been a complete disaster. As we look back at his best moments this has to be towards the top in terms of creativity. It did not take a stroke of genius to draft John Tavares first overall the next season. In addition, having the salary cap space to accept salary dumps of Nick Leddy and Johnny Boychuck also don’t receive praise. The trade for Mat Barzal may end up in the conversation but even that trade involved totally whiffing on a top five pick (but just realizing it before Edmonton did). When comparing all of Snow’s creative moves for this organization, the Josh Bailey draft has to be considered the most creative. The difference between the good and bad teams are how the get talent that is not obvious to everyone else. Josh Bailey has become the dependable veteran this team needs. Josh Bailey has stepped into the role the Islanders envisioned for Andrew Ladd. Bailey has become a player dependable in all three zones of the ice and plays in any situation the game calls for. There is no reason to believe that Bailey won’t be a 50 point scorer again this season. Even if he played at his career average for the rest of the season he would get to that mark, and Bailey is not the same player he was three years ago. Josh Bailey is an unrestricted free agent at the end of the year and he will receive a raise from his current 3.3 million dollar a year contract. For compression Bryan Little of the Winnipeg Jets received a contract extension of 6 years 31 million dollars. It has been two full seasons since he eclipsed the 50 point mark and has not played in more than 60 games in that time. It would not be surprising at all to see Bailey get a similar contract. The average annual value of that contract would be similar to that of Nikolai Kulemin. Josh Bailey may be one of the most underappreciated Islanders we have ever seen. It has been good to see the fanbase turn the corner on him. He has become the veteran forward that teams need to be successful. It is weird to think of Bailey as the longest tenured Islander but here we are. I would expect Bailey to sign a 5 year 25 million dollar contract. 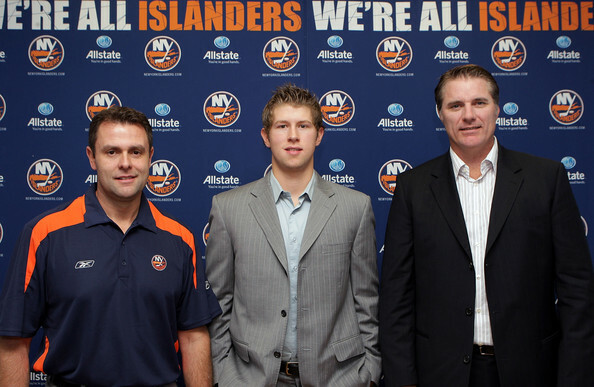 By the end of that deal he will be an Islander for 15 seasons. Garth Snow knew what he was doing when he traded down twice to draft Josh Bailey. This is Garth Snow’s savviest move as the Islanders General manager.